Perforated 11½ and 12, watermark 8 (Wide Crown and wide A), typographed. Stanley Gibbons does not list a #7. The £2 value was actually produced in error - it should have been a "half crown", or 2 shillings and 6 pence value. All stamps were comb perforated with 15 holes per inch, or 11.7 x 11.8. Control of the postal service in the Commonwealth of Australia was assumed by the central government on March 1, 1901. Stamps of the individual states were valid for postage in any part of Australia until a common issue was released. The first stamps issued by the commonwealth was postage due labels (Scott #J1-8), in July 1902. They were made from the plates used for the New South Wales dues stamps, with the inscription N.S.W removed. They were valid in all states except Victoria. On October 1, 1907, Australia became a member of the U.P.U (the individual states had joined October 1, 1891). In July, 1909 postage due stamps were issued (Scott #J39-49) for the whole commonwealth, this time using the design of those used issued in Victoria, but inscribed AUSTRALIA. From May 1, 1911 postal rates were made uniform in all the Australian states. The first common postage stamps were issued on January 1, 1913. The actual first day of use is January 2, 1913 since January 1 was New Years Day, a holiday. 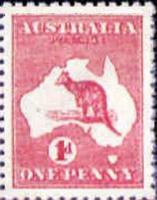 The first stamp issued was the one penny red (Scott #2, 2a, 2b, 2c, S.G. #2), showing a Kangaroo on a map of Australia, printed in a total quantity of 1,052,800,000 stamps - yes, that’s over one billion! Simple as that! Fortunately for the first issue collector this is the least expensive stamp in the set, at around $1. The full set of 15 stamps list for £3,000 used in S.G. and $3,325 in Scott 2003! To be sure you get the very first issue, you should go for a "Die I" stamp. Incidentally, only one die was ever used to produce the stamps! The various die varieties mentioned in catalogs are actually just the result of repairs and normal wear and tear. Since over 5,000 impressions were made from this one die, you could argue that over 5,000 "dies" exist. The next stamps in the set with the same design were: Scott #3 on Jan. 15, #1 on Jan. 16, #7 and #8 on Jan. 18, #10 on Jan. 25, #4 on Jan. 27, #11 on Jan. 30, #9 on Feb. 1, #6 on Feb. 19, #5 on Feb. 28, #12,13 and 14 on Mar. 20 and finally #15 on Apr. 8. S.G. does not list a #7 and therefore list the set as #1-16. The same design has been used on numerous other issues, with different watermarks, perforations and production methods, so please check your copies against your catalog to be sure they are from the first set. On February 14, 1966 decimal currency was introduced in Australia. All pound, shilling and pence values were withdrawn from post offices, though they were still valid for postage for a short time afterwards. This includes the stamps issued prior to 1913 by the individual states, since those stamps had been valid for all this time!